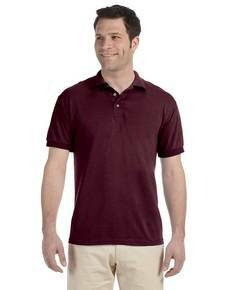 Not your ordinary polo, the Jerzees 437 Adult SpotShield polo is one-of-a-kind. Made using 5.6 oz of 50% cotton and 50% polyester, the Jerzees 437 offers breathability, durability, and is specially made with SpotShield™ stain-resistant treatment. With a two-button placket and bottom box stitched reinforcement, back neck tape for a clean finish, and tagless label for added comfort, this is a top choice for adult wholesale jersey polos. Available in sizes ranging from S-5XL and offered over 25 vibrant colors, the Jerzees 437 is perfect for a day at the golf course or for all of your embroidery needs!